Economic developers in Montana are amplifying an already attractive environment for executives to fulfill their need for business success and ample opportunities to play. Officials are strengthening the higher education system and workforce training efforts, encouraging private sector driven economic strategies, and establishing additional transportation and site infrastructure. They also nurture expanding industries such as biosciences and photonics, and encourage entrepreneurship and innovation — catching the attention of the Kauffman Foundation. The organization ranks Montana as the No. 1 state for its ability to produce more startups per capita than any other state. Rogers says the Main Street Montana Project established 13 key industry networks that are almost entirely populated by the private sector. The strategic plan’s efforts are ongoing, such as state government’s improvements to the permitting process. More than 460 rules and procedures have been repealed, and almost 250 have been streamlined and/or updated, according to the project’s 2015 report. Another of the project’s initiatives is the $25 million RevUp Montana workforce program. Initiatives include expanding the dual enrollment and certification of high school students earning college credits and skills certifications. Training programs are being expanded and/or realigned. For example, Montana State University’s Great Falls College is conducting a nearly $2 million expansion of its metal and welding fabrication facilities, Rogers says. He says the college has expanded its dual enrollment capacity, which is not limited to welding instruction. At the local level, Billings Works is a workforce council consisting of 80 private sector, education and workforce development partners. Billings Works recently released a state of the workforce report and action plan for the next three years. “We are a growing community, and in fact, our workforce has grown faster than the national rate,” says Steve Arveschoug, executive director, Big Sky Economic Development. “Because we are a hub community we have a lot of demands for workforce.” Billings is the largest community within 500 miles, Arveschoug notes. *According to WalletHub, Montana ranks third in the nation as the best taxpayer return on investment. This year’s ranking focused on six categories: infrastructure, education, health, safety, economy and pollution. *In April, the Montana STEM Mentors initiative surpassed its goal of 100 STEM mentors agreeing to provide guidance to women and girls interested in pursuing a career in the STEM fields. The program began in December 2014, spearheaded by Lt. Angela McLean and Montana First Lady Lisa Bullock. *Outdoor recreation contributes to $5.8 billion in consumer spending, 64,000 Montana jobs, $1.5 billion in wages and $403 million in state and local revenue, according to a recent report from the Small Business Majority, a national advocacy organization. Among the 13 key industry networks are energy and utilities, health and wellness, manufacturing, small business and downtown, transportation and food and agriculture. Rogers says officials are marketing the state in a different way, realigning a number of things to create awareness. “We lead with our industries, we promote them,” Rogers says. Montana’s optics sector continues to expand as cross-industry uses continue to develop. This includes medical devices, and in one example, a company that manufactures equipment that identifies rotten almonds on a food processing line. The rotten ones put out a different color in the spectrum than the good ones. “The cluster grew out of a photonics curriculum established 15 years ago at MSU in Bozeman,” Rogers says. “We have about 28 companies located in the Gallatin Valley, which employ 517 people. Those companies are projecting 11 percent growth over the next year.” Many of Montana’s companies are staffed and led by scientists and engineers that were, or still are, participants at Montana State University’s Optical Technology Center, according to business.mt.gov. The city of Bozeman is also a supporting player in the cluster. In May, the city received $127,500 in Big Sky Economic Development Trust funds to assist Montana Instruments in purchasing equipment needed for an expansion. The company specializes in precise and innovative optical measurement solutions for research and industry. Bozeman is also home to companies such as DropTrip, Schedulicity and Zoot Enterprises. Zoot Enterprises started in a Bozeman basement in 1990, and today employs 250 people. The company develops software for the financial industry and was one of the early adaptors of cloud computing technologies. Schedulicity helps small businesses such as life coaches, chiropractors, hair stylists, massage therapists, automotive services, and business service providers, schedule and manage appointments online. DropTrip is the world’s first crowdsourced shipping social network. Another expanding industry cluster in Montana centers on the biosciences. There are more than 350 companies and organizations in the cluster, including Rocky Mountain Laboratories, Takeda Vaccines Montana, GlaxoSmithKline, McLaughlin Research Institute for Biomedical Sciences, and the International Heart Institute of Montana. In manufacturing-related activities, steel and metal fabrication firms are growing in the state, including The Boeing Co.’s Helena facility, which has expanded to support the manufacture of landing gear for the 787. ADF Group Inc. in Great Falls had completed a second expansion to add a paint shop. The company manufactures large components, mostly supplying the oil industry. 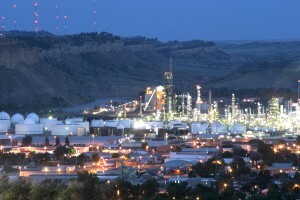 Montana’s energy sector is vital to the state’s economy. Rogers says even though prices for oil are depressed, there is still a lot of activity in the sector. Calumet Montana Refining in Great Falls is investing $275 million to double its capacity. CHS Inc. in Laurel is investing $406 million in an expansion and upgrades to support increases in diesel fuel production. Bozeman has been recognized by the U.S. Census Bureau as the sixth- fastest growing micropolitan area in the nation, based on numbers from July 1, 2013, to July 1, 2014. Gallatin County’s population increased by 2.8 percent to more than 97,000 residents. Fontenot says the university is an important player in the area’s exponential growth. “Bozeman has interesting ways of connecting people and MSU has a lot to do with that vibrancy,” he says. Bozeman is also home to the MSU Innovation Campus, which is undergoing a 42-acre expansion. Several developments at the Innovation Campus offer flex lab, office and light manufacturing space for lease. Incubation space is also available. Another asset is the $100 million in research expenditures that are integrated with the Innovation Campus. Rogers says local communities are developing infrastructure to accommodate economic growth, including the addition of industrial areas. Great Falls is in the process of creating an agriculture-related industrial park. Billings is moving forward with a comprehensive development plan to support a targeted economic development district. Arveschoug says the goal is create an additional 400 acres of industrial space in Yellowstone County that would have rail and other transportation assets. 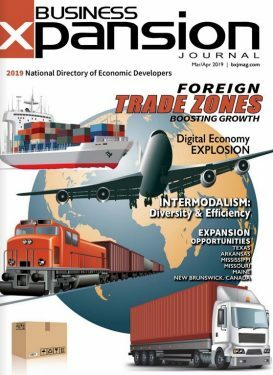 In regard to physical infrastructure developments, BNSF is investing $124 in northern Montana to develop double tracking and other improvements to accommodate increases in rail traffic, Rogers says. More than seven out of 10 Montana residents participate in outdoor recreation in Montana’s 30 million acres of public lands each year, in addition to tens of thousands of tourists who travel from around the world to enjoy the state’s natural resources. Source: “A Small Business Voice for Public Lands in the West,” published by the Small Business Majority. An example is Bozeman Yellowstone International Airport, which is the state’s fastest growing and largest airport. It is the sixth-busiest airport in the Pacific Northwest. There are numerous nonstop flights from Bozeman to destinations such as New York City, Atlanta, Chicago, Denver, Portland, Seattle/Tacoma, San Francisco, Los Angeles and Phoenix, among others. Arveschoug says companies can be a part of the Big Sky experience (fly fishing and mountain climbing among others) out their back doors and still “be in a large enough urban center that provides the size and infrastructure to support the success of their business,” he says. Montana’s natural recreation assets are not viewed lightly by executives. According to a 2013 study conducted by Business for Montana’s Outdoors, 70 percent of business owners say: “the Montana outdoor lifestyle” was a factor in deciding to locate or expand their business in Montana; and 89 percent say national parks, forests and wildlife areas are an essential part of Montana’s economy.